After a long winter I’m just so ready for something…anything…to remind me that warm weather might actually be right around the corner! After the first thaw or two, all we’re really left with is empty trees, brown grass, and mud. Brown, brown, brown. Thank goodness mother nature seems to pick up on my annoyance and cues the spring flowering trees and the tulip bulbs that I actually remembered to plant last year- hooray! Spring trees can really be quite spectacular. It’s as if some of them are competing to see who can put on the best show. 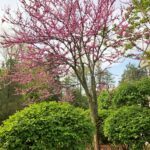 With blooms ranging in color from pale pink or snowy white, to purple or vibrant fuchsia, they can be a wonderful addition to your front yard. And lets not forget that they can also smell amazing! 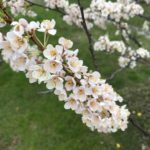 A flowering plum tree has such an intoxicating, sweet smell, it just puts a smile right on your face. 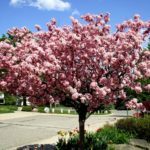 Start planting now to make your yard the envy of the neighborhood in spring! 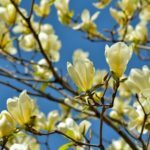 Some people might think of magnolias as a typical southern tree/shrub, but there are a number of varieties that actually do great in cooler climates as well. 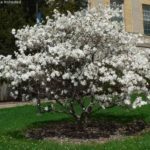 Ann Magnolia- broadly pyramidal to broadly rounded in habit. 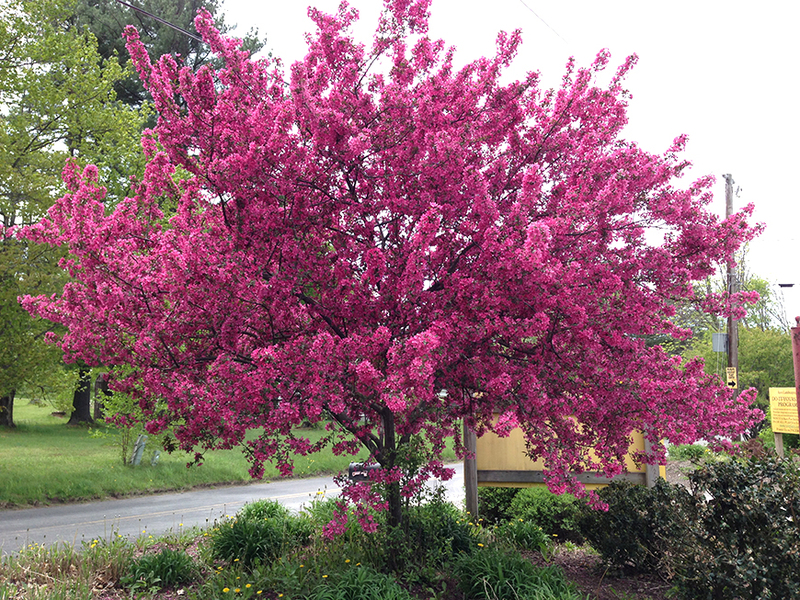 Beautiful, showy reddish-purple flowers in mid-spring. Part of the Little Girl Hybrid series introduced by the National Arboretum. Spread 8′ to 10′ height and width. Zone 4 and up. 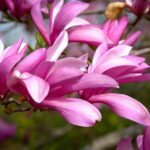 Butterfly Magnolia- hybrid magnolia known for its late spring, tulip-like yellow blossoms. 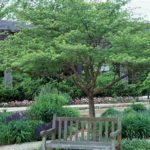 Upright pyramidal or multi-stemmed form, with glossy dark green summer foliage. Flowers have a light “lemony” fragrance. Zone 3 and up. Height 15′ – 20′, width 10′-15′. 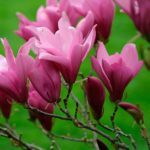 Messel Magnolia– upright becoming rounded with age. 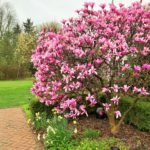 In late spring lovely fragrant, deep pink 4″-6″ flowers. Zone 4 and up. Height 15′-20′, width 20′-25′. 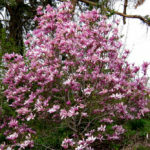 Merrill Magnolia– upright oval in habit, spreading with age. 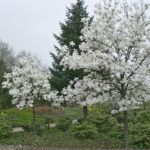 Masses of fragrant pure white flowers in April resemble a white cloud. Flowers at a young age. Zone 4 and up. Height 25′-30′, width 25′-30′. 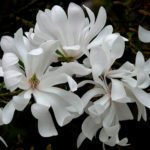 Royal Star magnolia- a slow-growing shrub or small tree native to Japan. 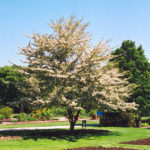 It bears large, showy white or pink flowers in early spring, before its leaves open. Spread 10′ to 15′ height and width. Zone 4-8. 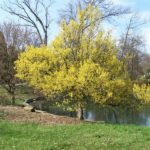 Blooming early to mid-April in zone 5b, it is one of the first trees to show flowers. 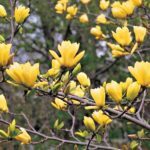 Yellow Bird Magnolia- bright canary yellow 3 1/2 inch flowers appear more dependably since they emerge with the foliage late in the spring after the danger of frosts. Zone 4-8. 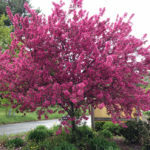 While crabapples are only in bloom for a few weeks, they are sooo worth it, in my opinion. 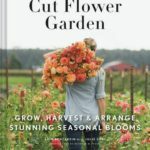 If you have the space, plant 3 or 5 down a path or in a grouping for an amazing spring show. 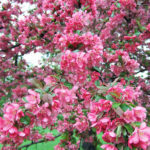 Certain types of crabapples will also hold their fruit well into the winter to which attracts the birds. 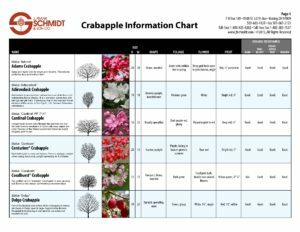 There are many types of flowering crabs, but here are a few common varieties, along with a PDF chart that I find helpful when making a selection. Adams- pinkish-red flowering crab with a mounded, dense crown. Dark, glossy red fruits persist throughout the entire winter. Adirondak- dense upright tree with dark green foliage. Dark red buds open to an outstanding display of single white flowers followed by orange-red fruits which remain through February. Coralburst- Coral-pink buds open to double rose-pink flowers. Donald Wyman- rounded with dark green foliage. 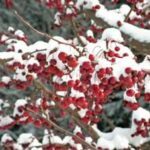 Single white flowers with persistent glossy, bright red fruits throughout all of winter. Prairifire- reddish-maroon spring foliage matures to dark green turning a good orange fall color. Striking single, bright magenta flowers. Maroon fruit is highly showy from July-March. Glossy, cherry-like bark. Purple Prince- fast growing, tailored tree. Deep purple spring foliage becomes bronze-green with age. 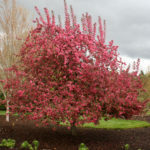 Bright carmine-red buds open to single, deep pink flowers. Persistent purple fruits with a blue waxy coat. Cherry-like bark. Red Jewel- abundant, single pure white flowers. One of the showiest of all crabs in fall with an incredible display of orange-red, jewel-like fruits which are showy through March. Sargent- an attractive compact, wide spreader with dark green foliage. 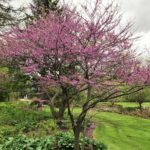 Red buds open to single, white flowers a week later than other crabs. Small, bright red fruits attract birds in early fall. 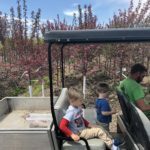 Here is a chart that I’ve used in the past to help when choosing crabapples. 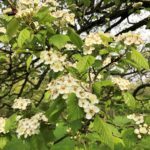 The hawthorn might be an unexpected choice, but in late spring they are covered in little clusters of white flowers and are actually quite pretty. 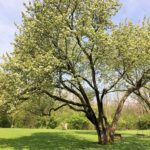 We have a number of them in our yard, but one in particular that is very old and large and it might just be my favorite tree in the yard. Thornless Cockspur Hawthorn- small tree, which makes an excellent, dense, screen. 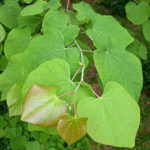 Lustrous dark green, shiny leaves. White flowers followed by brick red fruits. Rust-free. Virtually thornless. 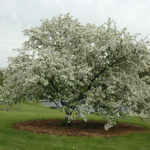 Washington Hawthorn- slow growing, dense tree that is upright in youth becoming rounded with age. Very showy pea-sized, orange-red fruit lasting into January. White flowers in spring, red-maroon fall color. Winter King Hawthorn- rounded habit with vase-shaped branching. 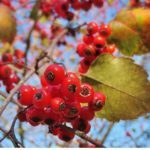 Showy, bright red fruits persist later into winter than any other hawthorn. Silvery bark exfoliates beautifully with age displaying combinations of cinnamon, gray and orange. Gorgeous, gorgeous, gorgeous! In the spring it is covered in tiny fuchsia flowers, followed by large heart shaped leaves for the summer and fall. These pictures just don’t do it justice. 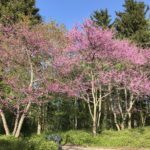 Eastern Redbud- typically grows to 20–30ft tall with a 26–33 ft spread. 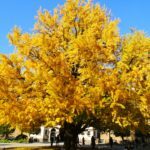 It generally has a short, often twisted trunk and spreading branches. 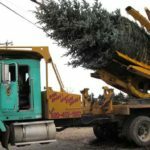 A 10-year-old tree will generally be around 16 ft tall. Can be single stem or shrub form. 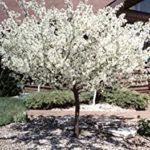 Fruit trees are great because they do double-duty! 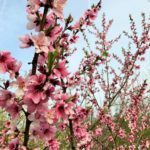 Beautiful, sweet smelling blossoms in the spring, followed by wonderful, healthy produce. 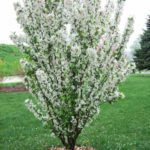 Plums, cherries, and peaches tend to bloom first, followed by apples and pears. 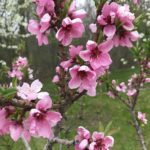 If you’ve never smelled a plum tree in full bloom, you are missing out! 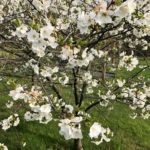 For a list of the different varieties to choose from, you can check with your local nursery, or you can see a list of what we grow in our orchard. Cornelian Cherry Dogwood- small-scale tree or large shrub. Showy, bright yellow flowers appear in early spring. Showy exfoliating bark on older specimens. Bright cherry-like fruits can make a fine jam or jelly. Great screening plant. 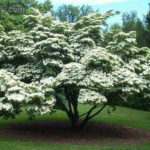 Pagoda Dogwood- shrubby, small tree with four-season interest. 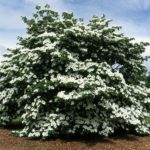 Creamy, flat-topped flower clusters in May are followed by blue-black pea-sized fruits. Early fall color is a rich, maroon. 15′-25′ height and width. 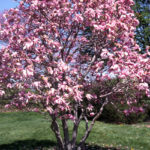 Pink Dogwood- with pretty pink blooms that grow darker as the tree ages, this is one of the first trees to bloom in spring. Zone 5. 15′-25′ height and width. 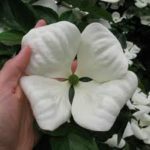 Venus Dogwood- A fast growing hybrid Dogwood that is distinguished by it’s exceptionally large, white flowers – as large as your hand. Deep green foliage turns red to purple in the fall. 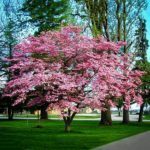 If you have any other suggestions for spring trees feel free to share. As always, happy planting!